We've already seen nearly an inch or rain (or more in some spots). 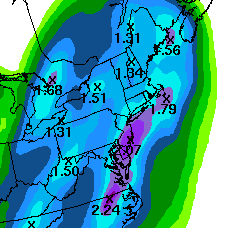 The HPC rainfall update now has an additional 1-2 inches from central Maryland to the coast. This is along the lines of what I mentioned earlier this week. Saturday afternoon: A cold front with the chance of a thunderstorm mixed in. 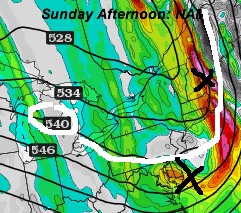 Then the cold air spills in in a few waves Sunday through Tuesday. Each will have a piece of energy, short wave (or vort max), that should carry snow showers over the mountains and through central Maryland. It has been a long day, so I am just going to post some charts below to make my case. 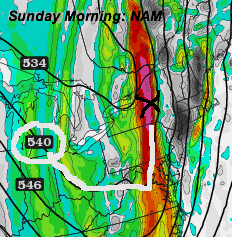 I am using the NAM model showing the 500mb vortivity (spin), and thickness between 1000mb and 500mb. The '540' line usually represents where the snow or freezing line would set up. Basically, I'd be surprised it we don't get snow here by Monday or Tuesday. Sunday morning, and afternoon each have a shot. The last image is Monday Evening. 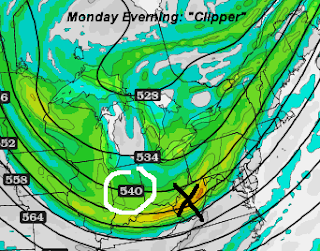 This one looks like a clipper type system. A bit more widespread, and the cold air will already be established. This has the best chance to coat the ground or more in the northern/western burbs... Stay tuned.